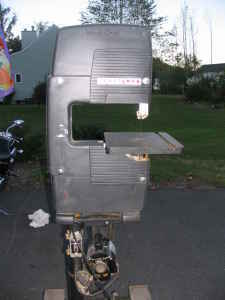 This is a Craftsman 12" Band Saw Model No. 113.2461 on a single pedestal stand. I believe that it's from the late fifties or early 1960's. It's listed in the Sears 1959-1960 Power Tool Catalog. I has a self-aligning upper blade guide with bronze blocks and ball bearing thrust wheels. It cuts to the center of a 24" circle. It has a solid cast iron saw table that measures 12 1/2" x 14 3/8." It uses an 80" blade. The saw is mounted on a single pedestal cast iron tool stand with with a 1/3 HP motor. my 113-24261 bansaw with stand was handed down from dad. after new parts and alignment, works great. knocked like hell when i got it. maybe have to bury me with it. old machinery is priceless. one guy was looking for roller guides. they sell new online for about $50 each. i like whats on it. sears sells almost everything else. just download mamuel free, then give sears service center part # and theyll tell u how much. all my old equipment still running. new equipment is cheap crap. well thats my 2 cents, what its worth. This is a solid saw. Moderately used but in great shape. Took a while to figure out how to Ste the upper and lower blade guides but I think I've got it now. I wish I could update the guides wirh modern roller guides. I use it regularly and I have modern big heavy duty and small detail band saws. My grandpa gave me this band saw a few years ago. The wheel tires (rubber bands on the pulleys) were worn out and spinning off. I used a truck tire inner tube to make new tires for the blade. Worked great. I see they still sell the rubber on the sears web site for 12.49. Save your $ and just make new ones out of old truck tire tubes. How can I get parts for this thing? I just picked up one of these saws. It looks to be in fine shape but the top wheel grinds against a bolt for about 3 inches each revolution. I figure that the wheel is not longer true. Is there anywhere that I can find a new wheel? Join in and write your own page! It's easy to do. How? Simply click here to return to Vintage Craftsman Band Saws.